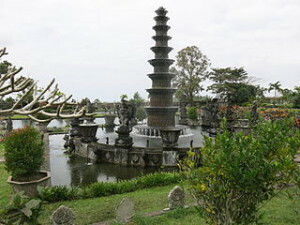 Puri Agung Karangasem was built in the 19th century by Anak Agung Gede Jelantik, first king of the Kingdom of Karangasem. This castle has a unique architecture, the castle is a combination of Balinese architecture, China, and Europe. Puri Agung Karangasem consists of three parts, namely bencingah, Middle Jaba and Maskerdam. Bencingah is the front of the castle, a place to watch the traditional arts. Middle Jaba is a central courtyard pool and garden castle. In the middle of the pond there is a building called the Hall Gili or floating buildings. Here we can find two old lychee trees. The third part is Maskerdam, the name is derived from the city of Amsterdam, this building was constructed at the beginning of the King of Karangasem has a relationship with the Dutch government. Karangaasem castle located 88 kilometers from Amlapura or if from Kuta, not difficult to find this place. Putung is a tourist attraction located in the village of East Duda with a distance of about 19 kilometers from Amlapura City or 64 kilometers from Denpasar city. This tourist spot is easily accessible by car. The main attraction of this tour is bjek panoramic beauty of the natural blend of mountains and sea. The scenery around showing terraced fields, clusters of hills with dense forest, rice terraces neat layout in Buitan, as well as Labuan Amok with vast stretches of ocean. Of Putung, Nusa Penida Island is very clearly visible. The beauty of Putung become increasingly famous for painting Mr. Christiano an Italian painter.